I’VE GOT SOME GREAT NEWS!!! It’s really true! I mean, what teacher doesn’t long for a brand new classroom rug. And folks, I’ve been given the SUPREME opportunity to spread my love for KidCarpets and their classroom rugs to all my readers. I’m so happy I can hardly contain myself. If you are one of the fortunate teachers that have a classroom rug, circle area rug or even a little rug in the library area of your classroom, count your blessings. For my own classroom, I had your run of the mill, school standard, typical brown (and very stained) wall to wall variety. It definitely left much to be desired in bringing any sense of coziness or warmth to the room. Here’s the evidence . . . I always wanted to be able to tell my kinders to ‘meet me at the rug.’ Let’s face it, in kindergarten, we are seldom in our chairs and ALWAYS on the floor. We work there, read there, listen to stories there, play games, write, build, dance . . . You name it, we do it on the floor. 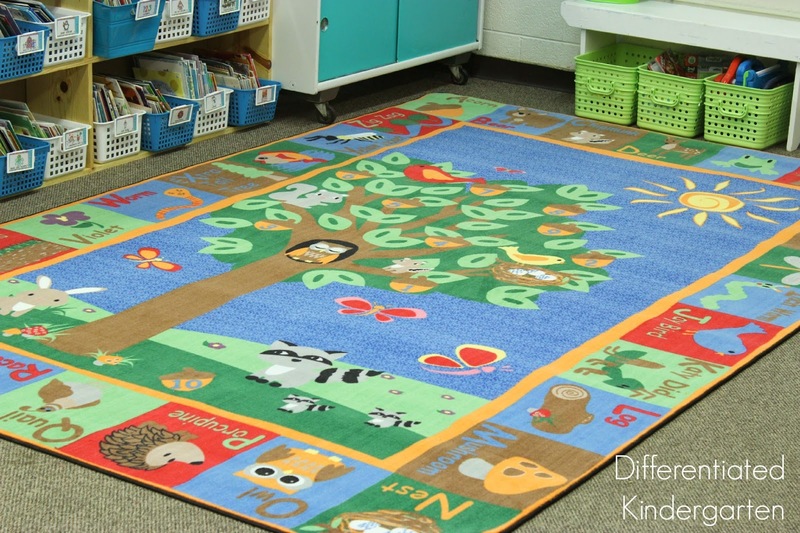 Every kindergarten classroom deserves to have a classroom rug as its anchor! But alas, there was no rug for my kinders. Until Jim Banks, the owner of KidCarpet, offered me the chance to not only choose one of his classroom rugs for my very own. I know you all get how exciting this was for me right? There’s not much that can bring more joy to a kindergarten teacher than a new meeting rug. But even better than getting one for myself is being able to now give my friends a chance to win one, too. Choosing a classroom rug for my classroom back then was anything but easy. I know, I know . . . I go from no rug to getting to choose a brand new beautiful one. 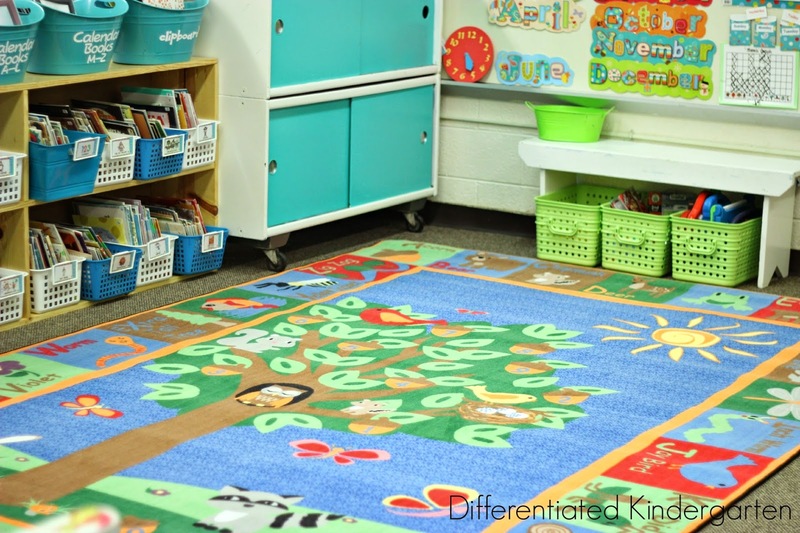 Choosing a new classroom rug was harder than you would think, because KidCarpet has soooooooo many cute styles and colors from which you can choose. I agonized over it, I gathered everyone’s opinions, and in the end, it came down to three. Finally, I decided on the Forest Friends. 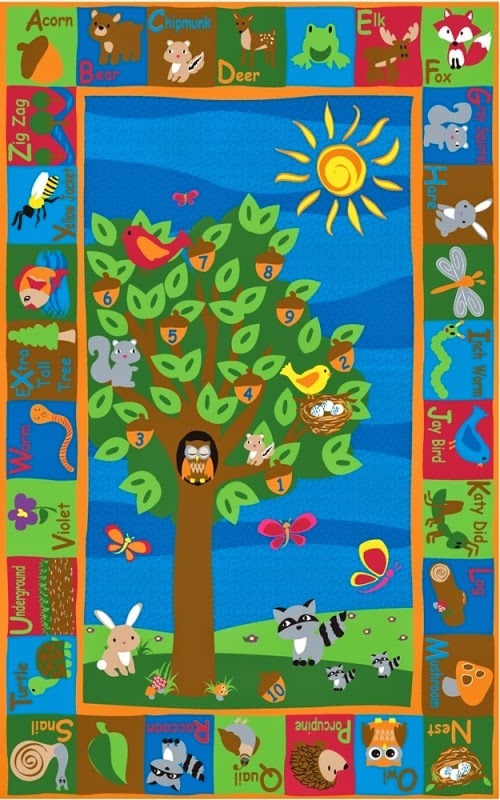 It has this sweet forest scene in the center with numbers scattered about and it was bordered by different forest items that represented each letter of the alphabet. 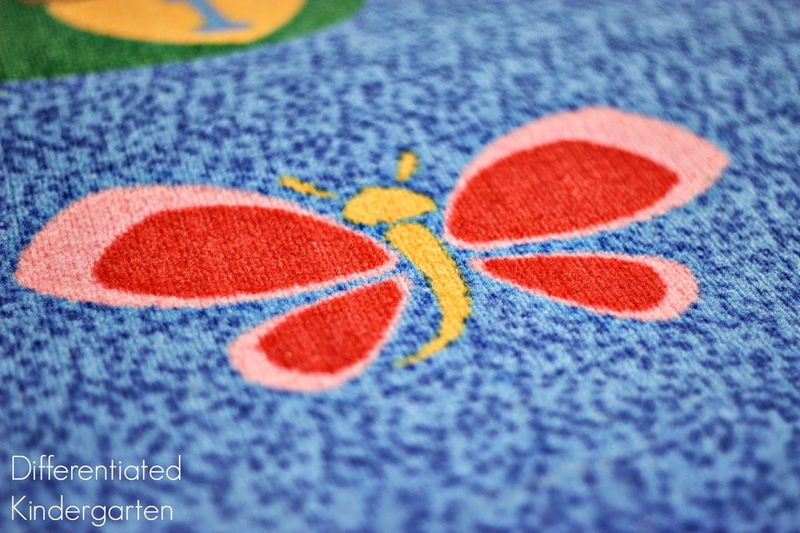 It wasn’t your typical kindergarten rug, there were no typical ABC or thematic pictures, and I could see myself using it in many different ways. And trust me, over the last four years I have used it a ton! So remember that before picture with the nasty brown carpet? Well, check out this after picture! This was after my new classroom rug arrived. Four years, hundreds of feet and a classroom move later, you will not believe how good my classroom rug still looks . . . I can not believe how much I love this carpet and the difference it has made in my room. I don’t know if I’ve mentioned this before, but my dad was a carpet installer for 45 years. (I love the smell of new carpet!) And if there is one thing I know, it’s carpet and this classroom rug is top notch. It has some amazing detail. And one of my favorite things about it is that this quality rug is made right here in the USA and the binding and backing are top notch!! The designs are clear and the colors are fabulous. And best of all . . . it’s kinder-toe-tested soft! I am absolutely thrilled with my classroom rug. It is such a wonderful place for my students to read and relax . 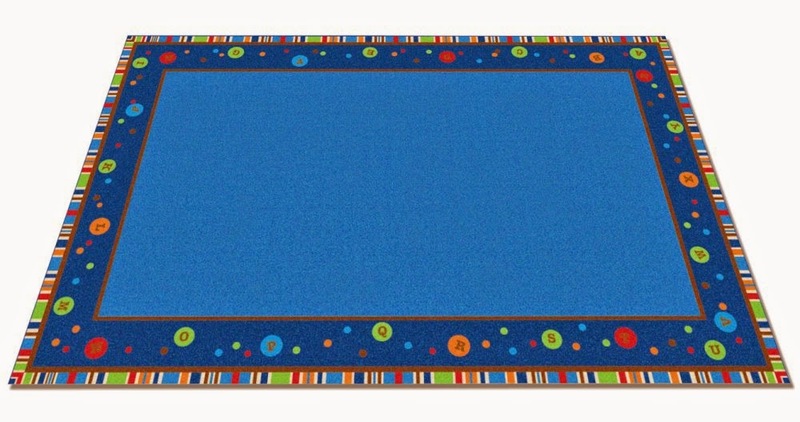 . .
A classroom rug similar to this one from a school supply company would run you nearly $400 plus shipping, but at Kidcarpet you can secure one for $279.99 plus FREE shipping in the continental USA. That’s because you are buying directly from the factory. 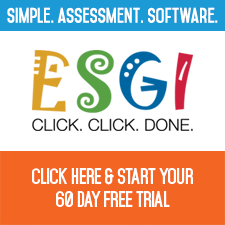 You just can’t find this kind of service, quality, and savings from anywhere else. It really is fabulous. And now the best part . . . I get to give one of these lovely rugs away to one of you. All you have to do is enter below for your chance to have a quality 7’6″ x 12″ rug of your own. The winner will get to choose their own 7’6″x12″ Kidcarpet rug (That’s a $279.99 value by the way!) and the company will wrap it up and ship it right to your school (and they even pay the shipping)! This giveaway is only open to educators in the continental USA, however. Shipping costs would get a little crazy overseas. Also, I will be monitoring entries so please make sure you follow the rules and requirements. Ok, so don’t waste any time. Enter right away. And please, tell your friends and colleagues about this giveaway and KidCarpet’s fabulous selection of classroom rugs. You really need to go check them out. I can’t wait to see what the winner picks!!! I love using my rug for meeting times, but mine is one with just squares. I LOVE the idea of “writing the carpet”! I have the “Stalking You On ALL Social Media” award, right? What a great giveaway! What a great carpet you picked. I could use a new carpet for my reading table area. I would use the carpet for my whole group meeting area. My 10 year old rubber mats from Sam’s are on their last leg! Thanks for the opportunity to win! How would you use a KidCarpet rug in your classroom? I always open and close my workshops (Reading and Math) on the floor. The rug would surely warm that up! My classroom rug is GRIMEY! It was donated by a very generous family, but it was used in their home for many years at their home as well. I would use a KidCarpet to add some color to our classroom and some coziness to our workshop meetings! We open and close each Reading, Writing and Math lesson on the carpet, it would be great to have a spot for all of my students to sit! I would love a KidCarpet rug in my classroom so that I can create a reading corner. My kids have begun to just bloom in their reading and they do not have a fun reading corner to just read. It would be wonderful to create an area to do just that! I would use it as a meeting area, no question! Sky’s The Limit: I’d use for circle time and my teacher station. 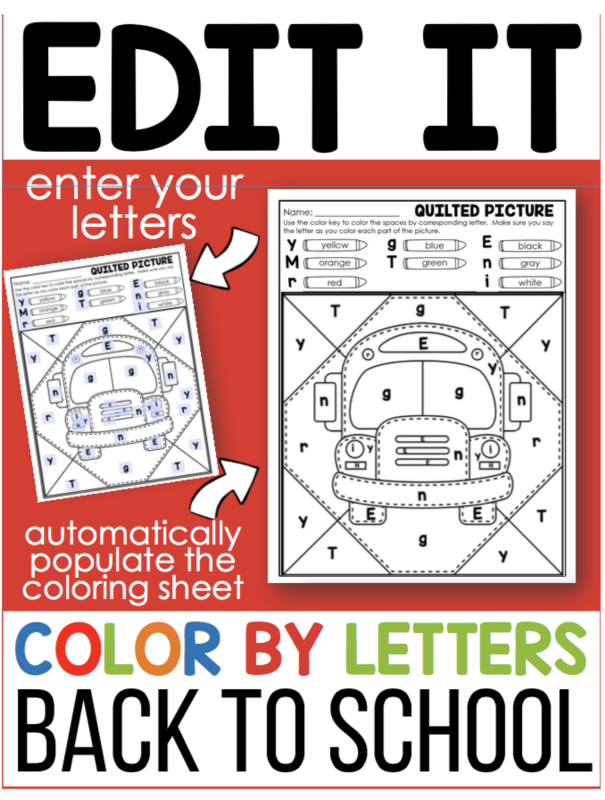 My students would love to review their colors, alphabet, and numbers while playing teacher. Total Transportation: I would use for my dramatic play station. The possibilities of scenarios my students could create from this rug seem endless. Who knows, my mind changes so much I may fall in love with a different one tomorrow. Looking at all of the choices was fun! I would love to have a new carpet for my library area. A new carpet would make this area more inviting and cozy for students as they listen to audio books and read to self. Fingers crossed!!! Thanks for the amazing giveaway!!! I don’t currently have a rug in my room. Just the same type of old stained wall to wall carpet like you have. It would be used throughout the day. Morning meeting, read-a-louds, read to self, math workshop. It would be such a fantastic blessing if I won! Thanks for the chance to win. I would replace the stained ancient carpet that came with my 42 year old room! I would love to create a cozy reading corner! I would use it for our meeting area. This would be great to help create a community feeling in my classroom! I have one big carpet for meeting that we also use for reading. I’d love to have a separate area just for reading What a great offer!!!! Awesome giveaway! I would love to win a new carpet! The one I have in my classroom is soooo old and getting really yucky! I would use this for morning meeting and I know the class would enjoy reading to themselves on the cute carpet too! I would use the carpet for a new and improved meeting area, and I would absolutely “write the rug”. How fun does that sound! I desperately need to replace the rug in my room. I inherited it from the former K5 teacher. I love it, but it is falling apart. I would use it as a meeting place for my students. So need a carpet. I was given one that has been used by 4 other teachers. It is old and needs to be retired. ABC Rainbow Seating Rug 24 (FE701-44A) from KidCarpet is the one I would choose. I would use mine for group activities. The one I have is old and yucky. I think it’s been used by at least three teachers before me. The carpets on the KidCarpet site are awesome! Such lovely carpets. I would use mine for whole group mini-lessons, and a place for kids to stretch out and relax during independent reading time. Rugs are a great place to bring all the kids together for some great bonding time! I have been teaching for 9 years and just stayed home this past year to have my 2nd child. 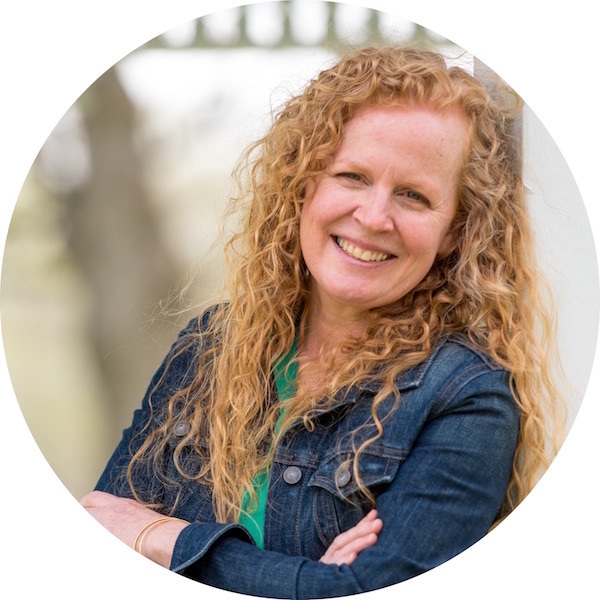 I’m now going back as a kindergarten teacher and your blog has been a godsend. I do not have any materials anymore because I gave them to a new teacher and this would really help out a first year kindergarten teacher!! Thanks for all you do to make differentiating your kindergarten classroom a reality! I absolutely love carpets! They not only make your room look wonderful and more complete but they help with classroom management by keeping all of the kids in one spot while talking to them or teaching a lesson. I would use a carpet for kids to sit at for the SmartBoard and for story time. 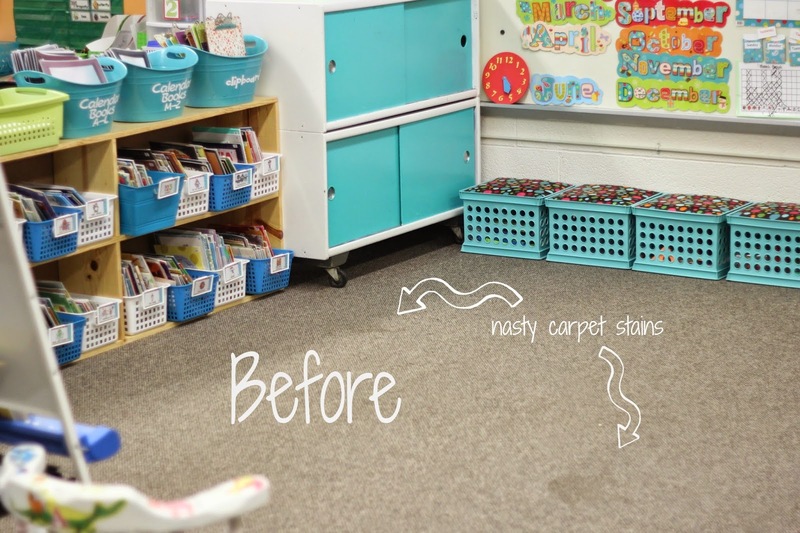 I would use the carpet in my PreK classroom – for our circle/floor time area. 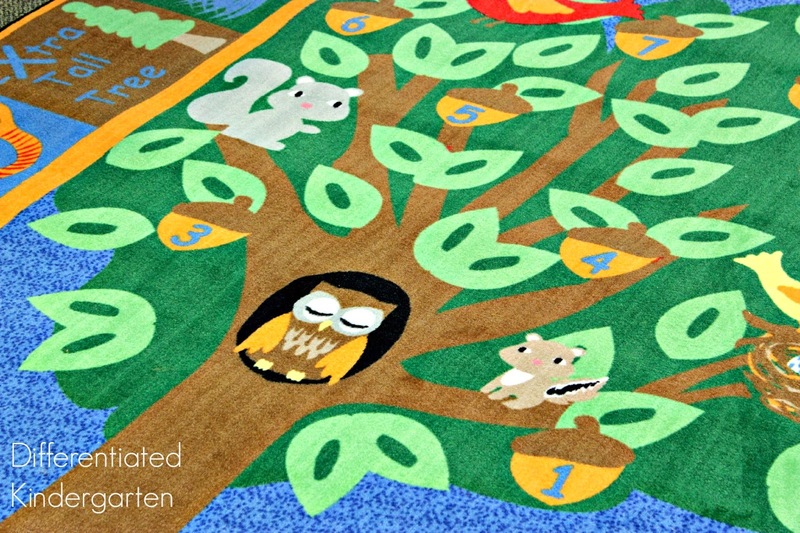 I really like the Forest ABC carpet as it fits in with my classroom theme and color scheme. Thanks for offering this give away….what an awesome prize!! I know what you mean. I had to do all the entries via my phone, because my school blocks Facebook. It took lot of time! I would love to be the proud owner of a rug in my classroom! I have been debating on purchasing one all year but couldn’t decide if I could afford it or not. What a great opportunity to get a chance to win one!!! I would love to have a carpet in my classroom to add some color. We use the rug during every transition time. Thank you so much for this opportunity!! I would be absolutely THRILLED to win a KidCarpet carpet! My school will be moving to a new building soon, and I would love to have a new carpet for my new room!! I will use it for morning meeting, stations, our daily yoga time, and for all the lessons we do on the floor as well. It would definitely be put to great use! I would love to have a new carpet for my classroom. I would use the rug for class discussions, a comfy reading space, and for a game/play area. I would use a KidCapet rug in my classroom as a central zone as well. I have a horrible rug now which isn’t comfortable or cute, and it’s WAY too small for my 23 second graders. We have to use an additional rug which doesn’t fit all of us either…we desperately need an upgrade! I need new carpet my is over 20 years old! My carpet is soooo gross! I would love a new, beautiful rug! I do all of my whole group teaching on the carpet as well as small groups and centers. It would get some serious use and look so much better than my gross rug! So many accidents on them and I feel bad for the kids sitting on a nasty rug!! My students come from very poor homes.. Most of them sleep with their parents because its the only bed in the house and usually its on the floor .. I would love for them to have a rug where they have somewhere nice to sit for part of the day. I would LOVE a carpet for my room! I would love to use it as a meeting place but also as a place for the students to sit and read. We have tile flooring and it is too hard to just sit on it. The rug would also add some ‘pop’ to the room. I would love a new rug!!! You chose the same one I would have picked. I’d use it for a general meeting area or maybe connected to our library. We could use it for small groups, playing games, etc. I would love a new rug to put in my library. All of my lessons take place on our rug! My current rug is old, dirty, and doesn’t fit all of my kids! It’s plain brown.  This would be an amazing addition to our classroom! I don’t have a classroom rug either! I would love to use one as a meeting space! It would also be nice to have specific spaces for each of my kiddos too! Thanks for the opportunity! My classroom rug is the same rug that the school purchased when they did construction ten years ago! This rug would be an amazing addition to my classroom!! I would love a rug to meet when I read to my Title groups. If I won a rug, I would choose one with letters, and we could play letter identification games with it. I would love it to go under my reading loft. I would love to use a rug with words on it for activities like writing the carpet. My rug now is just the basic alphabet rug so there’s not a lot of variety on activities. I am moving districts this year and my room is going to be empty. This looks like a GREAT company and an amazing carpet. I know my new firsties would love it! OH MY! I have no carpet in the classroom and this would be fabulous! We had a shag rug last year that stored mouse droppings (YUCK!). I would use the rug to replace the nasty ones my kindergartners currently use during carpet time! I would love to have a place for the kids to enjoy reading in any position they like (lying down, sitting criss cross, or with a soft stuffed friend). Wouldn’t that be comfy cozy? I think that will encourage them to read even more. I would love to use this carpet for students to do “listen to reading” or “read to self”. I will be graduating and starting my first kindergarten classroom in the fall. I am so, so excited, and I would love to have a colorful pop in my classroom. I’m starting Daily Five next year in a room with tile, and also beginning my own classroom library. I have put my heart and soul into collecting book on my own time, and I want the students to be able to have a place designated specifically for reading, decorated and dressed up to give ‘reading’ his proper respect, and to dazzle him! Wow, I would love to have a carpet in my library/reading nook. I’m moving to a new room without a carpet. I love your rug. It will look great with schoolgirlstyle woodland animals theme. I would love to have a new rug for my circle time in Pre-k. I would love to have this for our group area. The children could find specific things as a game or to sit on. There is so much we could do with this rug! It is adorable!! This would be such an awesome addition to my clasdroom. I love the vibrant colors and details!!! I would love one of these rugs for carpet time, reading, etc. These carpets really brighten up a room! I would use it for calendar time. I would love to use it for “Write the Room” during Daily 5! I would also use it for a defined area for meetings and calendar time. It would help my kids have a spot to sit in! Thank you for this opportunity!! I am participating in a professional learning group about small group and differentiation! I love your blog…thanks for being inspiring, and thank you for the opportunity for a new rug!!! OMG! I bought a terrible rug at Home depot that fell apart and now I have a bare white floor and a library that the kids song seem to love =( I would use it for read a loads,whole group lessons (with some fun clip boards), as a safe place to go to if you feel upset, as a place for independent work for creative writing! The opportunities are endless!!! I would LOVE a new rug! The one I have is sooo old and it has tape marks all over it. Goodness knows they are impossible to remove! :0( We do just about everything on that rug from morning meeting to our end of day story. If I win it will hard to choose which rug to get!! I would love to have a new rug for my room! The one I have now was left by another teacher and is terribly stained and coming apart. The students continuously pick at the fraying edges during instruction. Our district uses the workshop method for reading, writing, and math. I would love a new rug so we can have a clean, soft, and inviting place to gather for our mini-lessons and sharing time during these workshops. 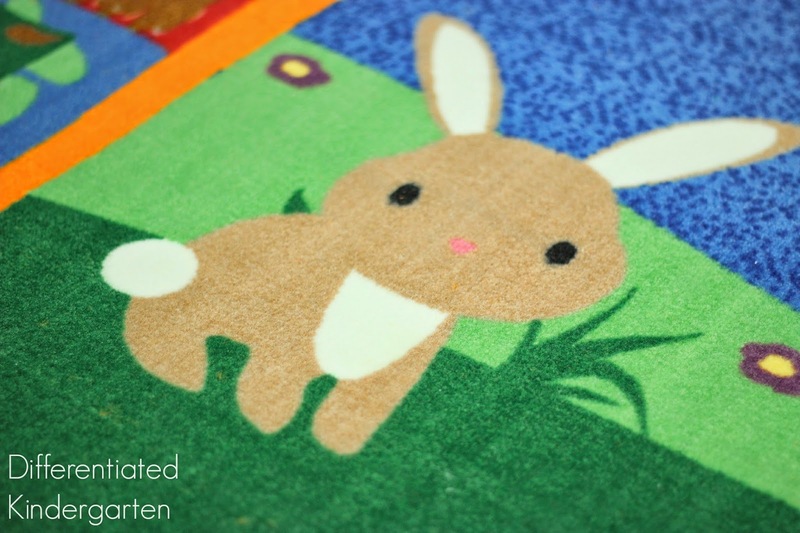 I think every kindergarten classroom deserves a new rug…and these are so beautiful! I know my cheap-o area rug from the local discount store has barely held up for 2 years…and it’s dirt-brown color. Ewww! How do you get hooked up with so many cool offers Marsha?! I’m jealous. Omg that rug is so fabulous!!! I have 2 raggedy ones that I got from Big Lots several years ago and my AU babies love picking at the fraying corners, so it’s time for a change!! Fingers crossed!! I would use the carpet in classroom library area to give the students something nicer to sit on while they read. Next year will be my first year in kindergarten. I would love to have a meeting area rug. The rugs look amazing. What a beautiful rug!!!! I would love to win a new rug! Winning a new rug would change my entire set up! I think all kindergarten teachers and children deserve a nice new rug to enjoy in their classroom!  Thanks for this opportunity! I’d love to use this for a meeting area in front of the easel and board! Wow! Those rugs look fabulous. I have always wanted a rug in my classroom for small group and whole group activities. I would love to win a rug!! I would love to win a rug for my classroom. I would use the rug for shared reading experiences, morning meeting, calendar time, and to enhance my classroom library area. Thanks so much! I would love a rug to replace the 12 year old dirty nasty foam square mat we use for morning meeting, calendar, reading, & some work station activities. My carpet squares are nice but we waste so much time moving them around and putting them in the right spot. I would love a carpet like this for my whole group teaching area. I would love to have a gorgeous rug like yours for my fifth graders. It doesn’t matter that they’re 10 years old. They love to get down on the floor to work. I can imagine them falling in love with their books or having our class meeting on the new rug. Your rug looks fabulous by the way! Would love a new carpet for my NEW room that I have to start from scratch! I will be the teacher for our new Level 2 program this next school year and it would be a great addition to what little we will be able to purchase!! I would love to have a carpet for circle time and to teach my Kindergartners about personal space! I, too, have the gross carpet stains all over my room. this would be amazing to win. My carpet looks a lot like your floor with all the stains from all the years. I’d love the ABC Dots carpet! 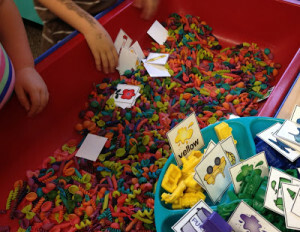 I’d use it for grouptime as well as for students to read, play with centers, and relax. Girl! I need a new rug for my new classroom! I would love to win one of these rugs. I have wanted one for 5 years now for my Categorical Classroom where I have K-5th grade students with cognitive impairments. They love bright colors, they love to be on the floor reading and they love each other! This would be great!!!!! I am going to redo my book area over the summer. A new carpet would be perfect for my book area! I love the rug you chose. I would use the rug in my classroom library. I would use the rug for my central meeting place, we would use it for morning meetings, smartboard lessons and activities, reading, etc! I think I would choose the Turtle Circle Time Rug (which is really a frog and lily pads) and it could be used for circle time, and definitely story time. 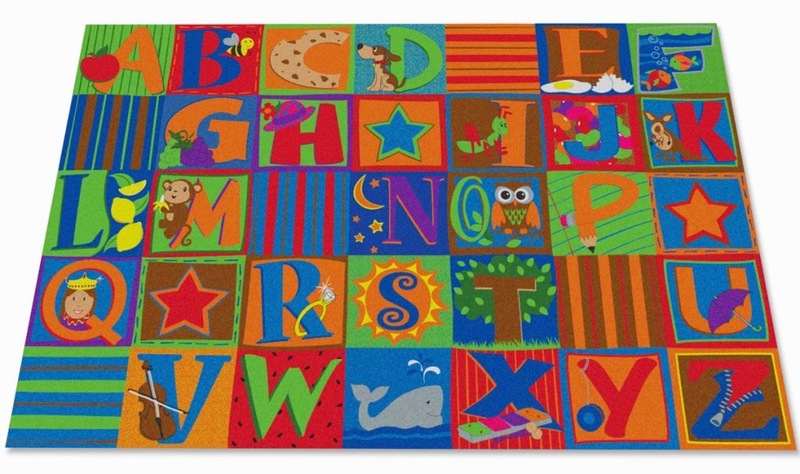 That rug also has the alphabet and numbers on it, so it could be use to practice identification and for fun games! I would use a Kid Carpet rug as my meeting area! It makes it so much easier for the kids to be able to identify an area of the rug that can be their ‘spot’! This is an awesome giveaway and I have my fingers crossed! 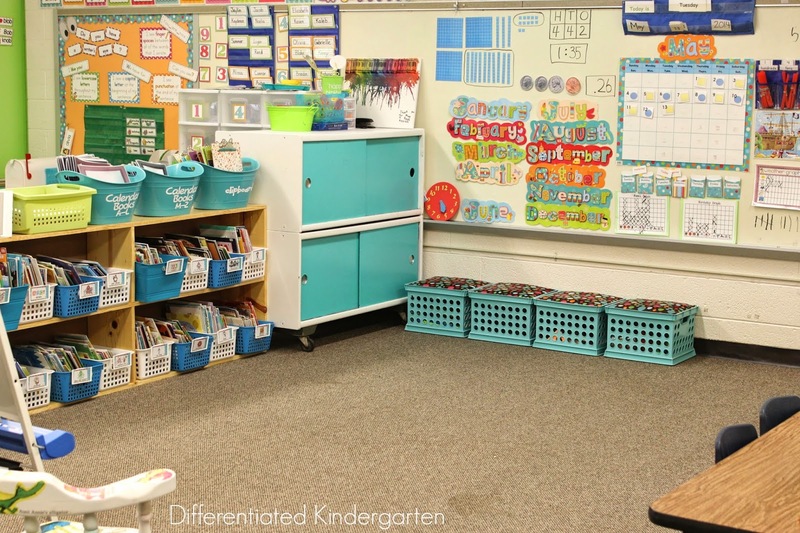 That rug fits perfectly in your classroom! I agree that all kinder rooms need a meeting rug! I would absolutely be thrilled to be able to have one! This rug would help my old classroom look new and add a much needed pop of color!! This would be a dream! 34 years in Kindergarten, so many things that I do have are getting that worn (or loved!) look!  Could definitely use an upgrade to what I currently have.  Thanks for an awesome giveaway! I am switching schools this year and my new classroom does not have a rug. I have always had one in the past and don’t know what I will do without one! They are so nice to have. I would ABSOLUTELY LOVE a new rug! I would use it to gather for morning meetings, whole group instruction, and during story time. I need a comfy gathering spot and winning this rug would be perfect. Thanks for the giveaway. Gorgeous rug!! I teach grades PK – 4 science, we’re always on the floor! We gather on our (old, stained) rug, talk about the experiment we’re going to do & then head over to the tables to try it out. We would put the rug to great use!! Thanks for a chance to win, love your blog! I teach kindergarten and we spend plenty of time on the carpet everyday. Right now I have a carpet provided by the school, it’s starting to show its age… a new and bright carpet would be a lovely addition to my classroom–especially because we’re moving into our brand new kindergarten complex over summer! Long overdue!  We’re so excited! Thank you so much for this amazing giveaway, Marsha.. I can’t even imagine how incredible this would be for my children. I buy some of my school supplies every year and this would just be… out of this world to be able to share the fun of one of these rugs!! Thank you SOOO much for the chance… I would use it for calendar, reading, group work, and just to maek the room cozier and safer! PS-I wrote the wrong instagram id on my entry.. it’s lauralove1110 sorry! What a wonderful giveaway! Thank you for this opportunity! I would love a new rug!! I had to get rid of mine because it was so gross. 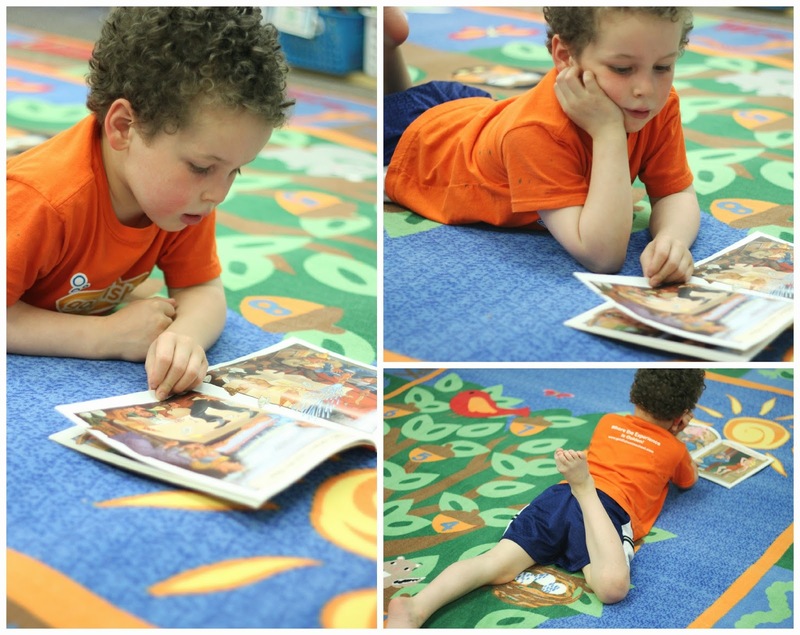 There are so many wonderful things you can do if you have a rug….I would use it for morning meeting, some of our centers, free reading time, etc. The possibilities are endless!! Thanks for running such a great giveaway! I love this rug! I would use it in the meeting area around my classroom centers. I would love to add any of these rugs to my classroom. Right now I have a boring blue rug – bleh! Adding one of these rugs to my classroom would brighten up the area and be a great addition. I would use the carpet for my calendar time, read alouds, and any Smart Board activities. My kiddos would love this carpet in the classroom! Since I just found out I will be moving to Kindergarten from Second one of these rugs would be a HUGE help in making my classroom feel warm and inviting! I would use the carpet as a whole group meeting area. This would be great in my library area! Thanks for the chance. I would love this rug in my Book Area..Where we have Morning Meeting, Read to Self, Read to Someone as well as play games together. I would love a rug to define my morning meeting area. I’ve currently have a rug for our meeting spot. But it is quickly falling apart. A new one would be much appreciated and put to good use! A rug would be the center piece of my room! We would sing, dance, laugh, and play on it! I would use the carpet for my reading area. We want to win this classroom rugs and carpets and wholesale oriental rugs looking. I have to visit recently visit sharafiandco.com and thank you for share. I’m moving schools and getting a new classroom next year! Carpets are SO nice to have for games, centers, and of course, teaching spaces! I would use the rug for circle time as well as for reading. I don’t have a rug at all and it would be very nice to have for my students. I would replace the carpet I have which is showing its age. I love the turtle circle time rug. It has everything I would need. I would replace my 15 year old rug! What a great pick me up for the kids and myself!!! I would use my carpet as a meeting area for morning meeting, read alouds, whole group mini lessons, and afternoon meeting. I would use the rug in my classroom library! What an awesome opportunity! I would use the rug in front of my mimeo board. The kids laugh when I tell them to come to the rug in front of the board and there is no rug… Like you said it seems like you should be saying come to the rug in Kindergarten! Haha! I am switching to a general education position this year and I would love to have this as the centerpiece of my room. It would be awesome! I have a hard floor in my classroom. I have always wanted a rug in my reading center that is big enough for more than one child. This would be perfect! I don’t have a classroom rug that actually “belongs” to our class; have one now that is borrowed from the district’s pre-k programs. I live in fear daily that they’ll need it returned and leave me with a very bare, cold floor for my kiddos! I SO need a rug of “our own”! I would love a new rug for my classroom. These carpets set boundaries for personal space on the carpet which can be a huge issue! I love the cute creatures rug and how each spot is clearly distinguished! Ever since I saw the name of this company a few days ago, I have been falling in LOVE with their carpets! I absolutely would love a chance to win one of these beauties. I definitely need one for my reading area. Thanks for hosting the giveaway! I would love a whole group meeting rug!! And I love how you are using yours to “write the carpet”. I would totally implement that as well! Thanks for the great opportunity and for introducing me to this company! I would use my carpet for everything from morning meetings to whole group games . There will be lots of fun learning going on at my carpet!!! I would love to win a new carpet!! I would replace the stained rug I have. We spend so much time on our rug, I would love to have one that goes with our happy room. I have too many tiled areas in my classroom and a small rug area, a new carpet would open up many possibilities! Would love a new carpet!! Thanks for the chance to win one. This would be so useful…It would replace an old worn out rug. These carpets are amazing! I would love one to greet my new kiddos next year! I’m trying to get that Kinder feel to my room and this would be the perfect touch! Thank you! I like to have 2 areas for reading, so an aide and I can both have a space on a carpet for a group. Would love to have one. What a fantastic giveaway! I have had a carpet in my classroom for 13 years and this year the vacuum cleaner decided to tear up one corner. I love having a carpet and it is the focal point of my classroom, not to mention the kids love it too! I would use it for morning board, calendar time, move to the carpet, free play, centers and writing! Love it! I would use the carpet for whole group meeting time. Reading/library area. To make a quiet cozy place to be and want to learn. I would use it for our whole group area! I would use one for my reading center. I think all classrooms should have a carpet that is big enough for the kids to use as they please. Besides the group meetings and smart board activities that we do on the rug, I think that learners who need to due their work somewhere else other than their desk are given the opportunity to move around, grab a clipboard and sit on the floor and do it. They can also grab their favorite book and cuddle in a corner or nook and read without their little legs getting cold. It completely brightens up a classroom and makes it more appealing to the children and gives them a sense of pride in their classroom. Thank you for the opportunity…I would use the carpet in my science center. I just found out I am teaching Kinder next year so I will need a carpet for a meeting place, math tub work area, reading area and anything else! I would love to have this! I am moving classrooms this next year and will have space for learning centers in our room. I would use the rug for a learning center and be able to have the kids sit on the floor instead of at a table or their desks. Thanks for such a great giveaway. Cute classroom oriented rugs within a price range are so hard to find. Thanks again. For group, quiet reading spot, for my wheelchair bound student to join his peers. I would use the carpet to replace the one i have that is unraveling! I have been wanting a rug badly for my classroom for years and years. They are expensive. I only have cold, tile floors. No carpet or rugs. 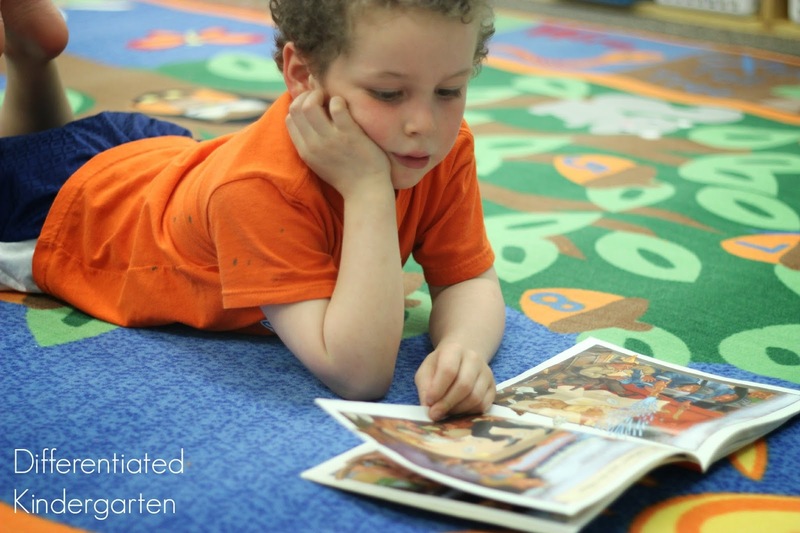 I’d love a rug where we can read books, meet as a class, or as a learning center. My rug is falling apart and there is NO money to replace it  I would use it in our meeting area! There is so much learning that goes on on the carpet! I love the carpets that have squares for the kiddos to sit on and have their own space! I currently have 70’s carpet in my room, original from when the school was built. This summer I will be getting new tile floors and will NEED a carpet for my kids to sit on for our core learning time. Winning one of these rugs would be AWESOME!!! The rug in my classroom is the same rug we used in my son’s bedroom. He is now 19! This rug is beginning to look a little worn! I would love a bright, new rug! I am trying to put carpets under all of my tables so I can take the legs off and go Bohemian. I desperately need a carpet for my students to sit on for whole class instruction. I hope that I win the rug, I desperately need a rug for my classroom. I have been looking around to buy one out of my own pocket, since my school can’t afford to buy me one. I have always wanted a rug for my kinders but in almost twenty years of teaching I’ve never been able to get one so fingers crossed and here’s hoping! I would probably just look at it for a long time and not allow anyone on it! lol But then, I would do circle time and also learning games with it such as find the letter or if I get a number one, I’d hunt a number, take away three or number before and after. I’ve got a million ideas saved up in almost twenty years! WOW! That is so generous of this company!! I have no carpet rug either and have resorted to using tape and it drives me NUTS!! LOVE the forest friends one! I need a new meeting area carpet!! This would be perfect!! What a great giveaway! I would use it for my whole group meeting area and for a place that students could go to read to self. Would love to create a cozy reading area! Thanks or the opportunity! I’d use it for our group area. What a wonderful area for our morning and afternoon meeting, our reading area and to use as a part of Write or Read the Room! I would love to use a new carpet to gather my preschool students with special needs for our class meetings and circle times, and for a nice place to read. I would use it in my library area. A carpet is an amazing classroom necessity! I would love a new meeting place/ circle time/ show & tell area! I would use it for my meeting time. My current rug is getting old, dirty and frayed. Really is time for a new one!! I would use it in my book nook area! This would look so great in my literacy area! 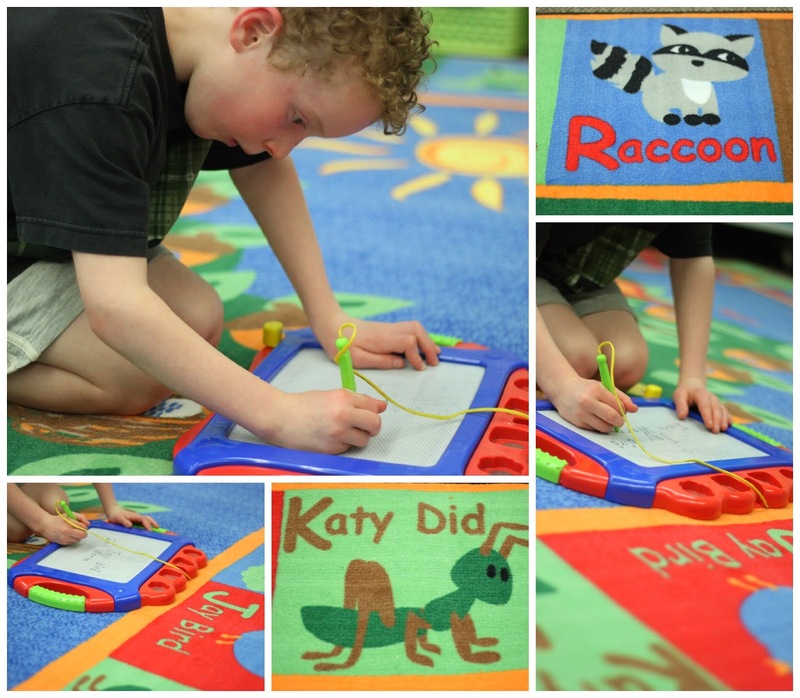 I could see my students using the rug for many different activities, including “write the rug”. Thanks for the chance! A new rug would be wonderful! 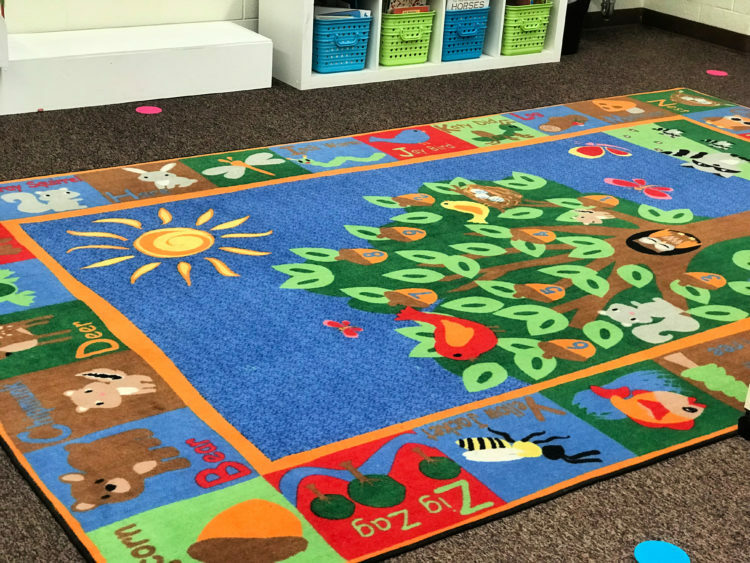 I use my rug area all day long–for whole group instruction; small group mini-lessons; partner talk; Read to Self; morning message; calendar, etc. The rugs at KidCarpet are all adorable!